Llandrindod Wells Band 1 - Channel 1 television and horizontally polarised FM radio were transmitted from superturnstile antennas mounted on a 65 m. mast. Both were 1.5 kW ERP and entered service on 4th December 1961. 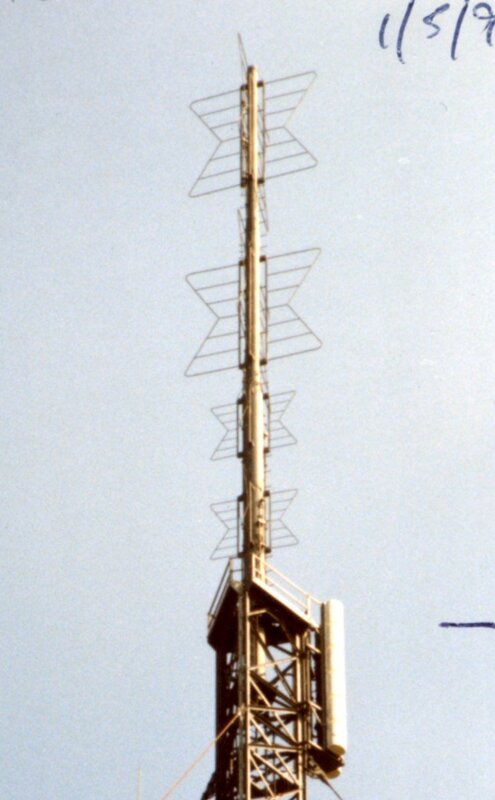 UHF TV would have used a cardioid antenna if the topmount position on the mast had been available, but instead used a side mounted 6 tier array of relay station panels as shown in picture 2 below. UHF TV commenced on 2nd April 1976, with S4C available from the launch on 1st November 1982. Not sure of the date this photo was taken but it shows the Band I, Band II and Band III antennas. The IBA Band III service used channel 9 with a ERP of 3kw, and entered service on 1st July 1969. From the size of the Band III receiving antennas the incoming signal must have been marginal from the IBA main station at Presely. This mast was used when the UHF service was added in April 1976, but subsequently a new tower was built for FM radio re-engineering to mixed polarisation in 1991. Band I and Band II receiving aerials will have been using the two wooden poles at the site. Two pairs of batwing antenna. Band I pair at the top of the support pole. Band II pair below the Band I on the support pole. UHF white panel antenna on the side of the mast (below the top of mast). UHF trough antenna for reception of Carmel. 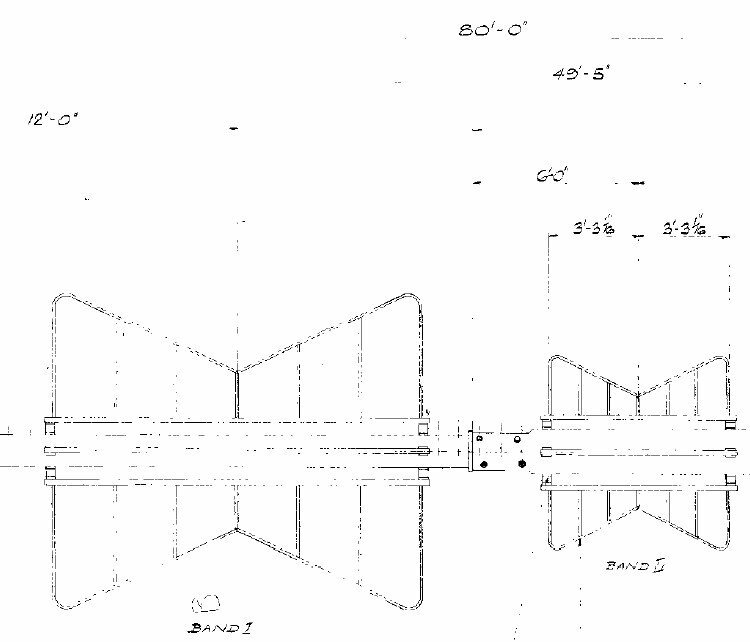 Batwing antenna are skeletonised to reduce windage. 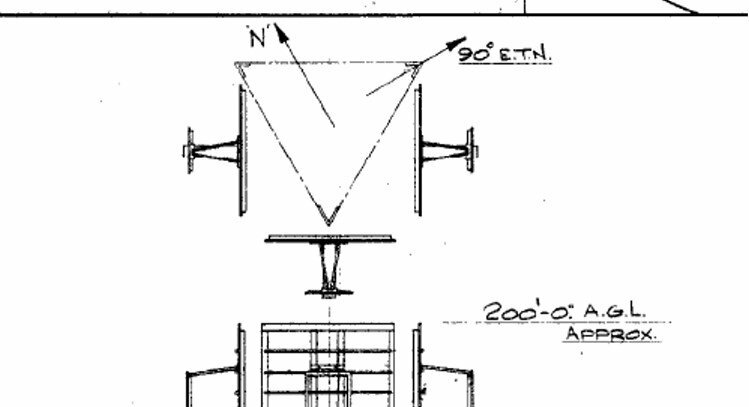 The Batwing antennas were made by EMI electronics. 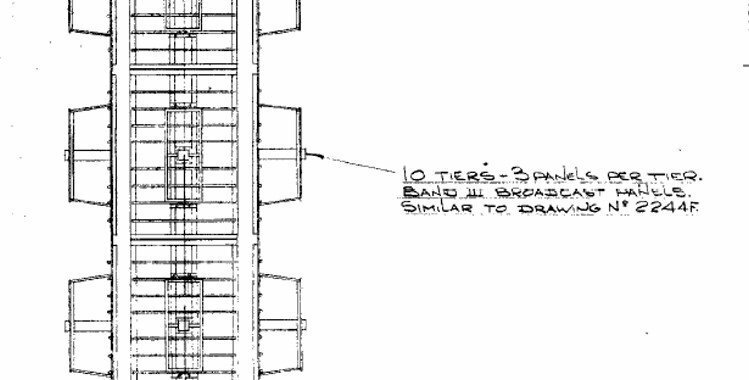 1962 drawings show that the Band I batwings are 13' 4" high and 24ft. apart. While the Band II elements are 6'6 1/8" high and 12ft. apart. The pole overall length is 80ft. However the Band III antenna which was removed before the above colour picture was taken was provided by Associated Aerials Ltd.